We’d love your help. Let us know what’s wrong with this preview of Love, Lies, and Hocus Pocus by Lydia Sherrer. The truth shall make you free… sort of. Armed with only wits and magic, she must manage her argumentative cat, thwart a plot to steal a powerful artif The truth shall make you free… sort of. To ask other readers questions about Love, Lies, and Hocus Pocus, please sign up. Love, Lies, and Hocus Pocus: Revelations is the second book in the Lily Singer Adventures series. Whilst I adored the first book, a part of me enjoys this one even more. To anyone who has found this book without reading the first, I implore you to go and read book one. You’ll open this book to read ‘episode three’, a clear indication that you need to read book one first. Whilst it would be possible to fall into the world without having read the first book, it will be a much better read if you go Love, Lies, and Hocus Pocus: Revelations is the second book in the Lily Singer Adventures series. Whilst I adored the first book, a part of me enjoys this one even more. To anyone who has found this book without reading the first, I implore you to go and read book one. You’ll open this book to read ‘episode three’, a clear indication that you need to read book one first. Whilst it would be possible to fall into the world without having read the first book, it will be a much better read if you go and enjoy the first book. I promise you, both books are wonderful and you will not regret the decision to jump into this series. Book one ended in such a way that I had to grab book two instantly. I had so many ideas of where the next book would take us, and wanted answers instantly. Although the book did not go in the direction I had anticipated, I found myself in love with the story. It opened up so much more, it gave us so many additional aspect of the world, and we now have a clear indication of where this series will go. We know what the underlying plot of the series will be, we know what major events the entire series is moving towards, and I cannot wait to see how everything is brought together. As with the first book, this is told in three parts. A Lily part, a Sebastian part, and a final Lily part. I found myself feeling much the same about these parts as I did with the first book. Part one left me intrigued as to how the elements would play into the overall story; part two left me with so many Sebastian feels; and part three blew my mind with the way everything was brought together. Honestly, I could rant and rave so much about part three alone – it was such a great element to add to the story, to the overall series. It linked so beautifully with the first book and the things we found out, and it leaves us with so many glorious possibilities of where the story will go next. Honestly, I cannot wait to see what comes next for this series – there are so many possibilities. Not to mention, I loved the way in which the characters grew in this one. We find out even more about both of our main characters, things that link to the world as a whole. This book does more than simply move the story forward, something it does wonderfully, this book also shows us so much more about the characters – whilst they were wonderful in the first book, my love for them grew even more in this one. It’s not just a book of revelations, it’s a book of development – with both things being fabulous. Honestly, I’m so addicted to this series. Everyone should go and read it. It’s wonderful. I need more. There’s no question about whether or not I’ll be following this series – you couldn’t stop me if you tried. Gah this series has me totally hooked! Wow! This book was so good and how lucky am I to start the new year with a 5 star read? Before I finished book 1 I already bought book 2 as I knew I had to continue the series, then as soon as I finished there was only one book I was in the mood for namely book 2. So I started this one right after book 1. I keep thinking about this series and the world even while I am not reading. And my breakfast and break times (which is when I read) seemed to get longer Gah this series has me totally hooked! Wow! This book was so good and how lucky am I to start the new year with a 5 star read? Before I finished book 1 I already bought book 2 as I knew I had to continue the series, then as soon as I finished there was only one book I was in the mood for namely book 2. So I started this one right after book 1. I keep thinking about this series and the world even while I am not reading. And my breakfast and break times (which is when I read) seemed to get longer and longer as I was so absorbed in reading and had to finish just one more chapter. I was totally into this book and decided it deserves that rare 5 star rating as it happen so rarely a series catches my attention so completely like this. Book 1 was really good, but book 2 is even better. And the titles are so fitting. Where book 1 is the beginning and introduces the reader to everyone and the world, this book takes it further and it definitely lives up to it's title revelations. Oh and I just have to say how much I love these covers, even more so now that I am reading these books. There are so many little details that seem a coincidence or random on the cover until you read the book. Almost every detail on the cover refers to something in the book. It's fun to figure it all out when reading and realize what really is on the cover. Revelations is told in three parts just like book 1. First we have an episode from Lily her point of view, then an interlude from Sebastian his point of view and then another episode from Lily her point of view. And while it might sound like the story would feel fragmented because of that, that is not at all the case. There is a big sense of continuity in the story and each episode builds upon the previous ones and refers to it as well. And there's some really well placed foreshadowing when you look back at the end of this book. It's very well written and kept my attention from start to end. I already liked Lily and Sebastian in book 1, but I grew even more fond of them here. They are both such interesting characters and I felt like they acted so realistically and believable. And while I would like to say Lily her actions in episode 2 of this book are unrealistic, I can't say that, as it was realistic and in character no matter how much I wish she didn't do what she did. And in some way it was necessary for her as a character and the plot of the book. And we get to learn a bit more about Sebastian as well, while he still is a tad mysterious as well. I just gobble up every piece of information about him that we get. And there's a great development surrounding Sir Kipling (Lily her cat) in this book that was so much fun. Sir Kip has quickly become one of my favorite characters. There are also things that were kept a secret from Lily and in this book we finally learn why. And the epilogue just left me with all these warm and happy feelings. Oh and there's this hint of romance and it's one of those deliciously slow building romances that I love. It's totally a side plot and not the focus. But all those tiny hints and gestures are so perfect and I can't wait to see if they become a couple, but at the same as I love a good slow building romance I wouldn't mind waiting another few books before that happens. Gah these two are so perfect together and I love seeing them grow just a bit closer. Although I really wanted to shake some sense in them at some point too as I know these two should be together and I was sad to see them hurting, but that's just a sign of how invested I was in this book and the characters. I already mentioned the world building in my review of book 1, but I am still going to mention it here again. This world is so well crafted, it feels like every new piece we learn and everything that happens just fits in so nicely within the established rules. Everything makes sense. There is no bending of rules, it all fits neatly into what we already know of the world. I loved learning more about the wizards and some history about them. We get a sense of what else it out there and get to see some glimpses of the other magical beings in this world. I think the Lily Singer Adventures are my new favourite series! Following on from the aftermath of Beginnings, in Part 3, Lily is back to work at Agnes Scott College and further investigating the myriad of artifacts in the basement. Her interest piqued by a piece of stone she can’t fathom, she decides to return home with it and back to Sir Kipling, where things take an unexpected and glorious turn. Summoned by Madam Barrington to help strengthen wards around an ancient tablet on display in the l I think the Lily Singer Adventures are my new favourite series! Following on from the aftermath of Beginnings, in Part 3, Lily is back to work at Agnes Scott College and further investigating the myriad of artifacts in the basement. Her interest piqued by a piece of stone she can’t fathom, she decides to return home with it and back to Sir Kipling, where things take an unexpected and glorious turn. Summoned by Madam Barrington to help strengthen wards around an ancient tablet on display in the local museum, can it be too much of coincidence that Sebastian is warned of a plot to steal such an item? It’s a great start to Revelations, Sir Kiplings new talent is fantastic and if (like me) you’re a cat owner, it adds a bit of depth to the hilarity of the situation at times. I love that Madam Barrington is taking more of a role in this part too, and I really felt for her in her struggles with knowing whether or not to trust Sebastian. Tina is a great new character too and the the climactic ending of this part is a massive page turner! Part 4 see’s Lily accepting an invitation from John Faust Le Fay, the wizard from the time loop episode in Beginnings. I think it’s fair to say that Revelations truly lives up to it’s name in this part, not only does Lily find herself catapulted into a new world - seemingly full of wonder she is also forced into the society life of the wizarding community, where things start to go amiss. I love the transition from light to dark in this part of the story, things go crumbly for Lily very quickly, having been almost in a fairy tale bubble before. The truth about her parents and her heritage become overwhelming and she is owed many answers by those closest to her. These books are such a refreshing read, I love how you never get bogged down with them as they are split into 3 parts but all are still connected by a single story arc. They are both lighthearted and dark at the same time and always beautifully written with gorgeous chapter illustration. On to book 3! Just like the first book, this one was very entertaining! I enjoyed the second part a lot more than the first, but I still thought both were really good. The intermission from Sebastian's point of view added a very interesting change in perspective, though I did think it made Lily seem a little more unreasonable later because we were just in Sebastian's head and know what he was thinking. But I think she was supposed to be a little unreasonable towards Sebastian, so that worked out well. I felt Just like the first book, this one was very entertaining! I enjoyed the second part a lot more than the first, but I still thought both were really good. The intermission from Sebastian's point of view added a very interesting change in perspective, though I did think it made Lily seem a little more unreasonable later because we were just in Sebastian's head and know what he was thinking. But I think she was supposed to be a little unreasonable towards Sebastian, so that worked out well. This series is addictive! I've only finished this book and I want to read more. Lily, although a skilled and powerful wizard, shows her fears and longings hidden behind the the archivist/librarian outer Lily. In this book, she discovers more about her long gone father. But is he the father she so much wants? Past mysteries are revealed and new ones show up. Which hopefully means more stories. This book ended far too quick it just seemed to get started. This is the second book in the Lily Singer series and although I am quite fond of the first book, this one was even better. The characters are becoming more rounded and the story with its twists and turns will put you on the edge of your seat and make your jaw drop. I really enjoy the author's writing style and the format chosen for the series as it truly adds more character to the book (pun intended). Can't wait to read the next one. Interest growing! Can't wait for the next one. Book two does not disappoint as revelations lead Lily into trouble; we continue with plain old good writing. Characters are developing and world building is subtly occurring as Lily learns about her past. I recommend this series as something different in the urban fantasy genre. Good writing, a solid, different kind of world and the ability to create tension without slipping into darkness make this series worth reading. The story flowed just as well as the first book in this series, and the characters felt more real. A lot of things happen that answer some questions that the first book left us with, but also gave us more things to look forward to in the next books. I felt more connection to the characters and was able to get into the story right off the bat. The story also kept me interested throughout the book. I'm eager to continue to the next book to find out more about Sebastian's connection to the Fae, and The story flowed just as well as the first book in this series, and the characters felt more real. A lot of things happen that answer some questions that the first book left us with, but also gave us more things to look forward to in the next books. I felt more connection to the characters and was able to get into the story right off the bat. The story also kept me interested throughout the book. I'm eager to continue to the next book to find out more about Sebastian's connection to the Fae, and to see how Lily progresses as a wizard after everything that happened and the answers she uncovered in this book. Singer shows great narrative prowess in the 2nd book of the Lily Singer Adventures. She kept me on my toes, throwing surprise after surprise into the book. I'm looking forward to seeing what else is in store for Lily, Sebastian, and Sir Kipling. Lily never forgave her mother for stepping away from magic and keeping her heritage from her. When Sebastian requests her help with an unusual case, the last thing she expects is to find a connection to her past. Now of course she knows exactly why her mother kept her away, but it's too late to save her now...Or is it? Lily's familiar cat and her never do well friend bond together to rescue her. I can not get enough of this series. I hope it never ends!! A wonderfully crafted story that grabs your attention and doesn’t let go! As shown by the fact that I am writing this review at 3am after having not been able to put it down! This are just starting to get interesting for Lily! Revelations is definitely that and more! Kindle Unlimited A bit too well 'chick' for me personally here and there but reading them all so that speaks for itself. Love, Lies, and Hoc Kindle Unlimited A bit too well 'chick' for me personally here and there but reading them all so that speaks for itself. I never thought it possible to find a book more enjoyable than the first instalment of ‘Love, Lies and Hocus Pocus,’ but Lydia Sherrer has really outdone herself, presenting one crazy adventure after the next in the sequel. Sir Kipling’s ability to communicate with humans left me laughing out loud in many places. With the mystery deepening on each page, I found myself unable to stop reading until the very end. 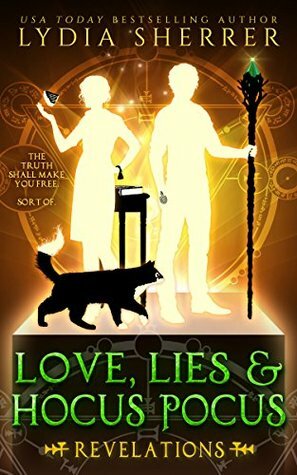 Lydia Sherrer has captured the love and family connection between human and feline per I never thought it possible to find a book more enjoyable than the first instalment of ‘Love, Lies and Hocus Pocus,’ but Lydia Sherrer has really outdone herself, presenting one crazy adventure after the next in the sequel. Sir Kipling’s ability to communicate with humans left me laughing out loud in many places. With the mystery deepening on each page, I found myself unable to stop reading until the very end. Lydia Sherrer has captured the love and family connection between human and feline perfectly. This is a book that will not only be enjoyed by those who love a dose of mystery, magic and humor, but also by cat lovers worldwide. What a great book! It took the fun and magic of book 1 and ramped them up. The third part of the book was non-stop twists and turns (although I knew who John was the second he showed up in book 1). Sebastian continues to intrigue. I think I enjoy his irreverent fun more than I do Lily's. All in all, an even more fun read than the first book. Revelations is the second book featuring archivist wizard Lily Singer and mercenary witch Sebastian Blackwell. As with the previous book, this one is separated into three parts alternating between the two characters. During the first part, Lily gets a surprise new companion, and must team up with Sebastian and some new allies in order to preserve a special magical tablet from being stolen. The middle story follows Sebastian as he hunts for the client who contracted to have the tablet stolen. The final part returns to Lily's perspective as she manages to end up the 'guest’ of some rather frightening people. The repercussions of this visit will be life-shattering for more than one person. Healings between estranged people end the story on a much happier note. I felt the writing improved between one book and the next, and I look forward to future installations in the series! I liked this one so much better than the first one. I still think Lily is a bit of a snob, but she was much more likeable in this one. Maybe because she clearly isn't as smart as she thought she was? I mean, come on, nothing seemed off? That's all I'll say about that. The structure worked better in this one since the interlude and the first story connected more to the last part. I still think it's an odd form, but I guess it's the easiest way to get Sebastian's perspective. I'm on to the next on I liked this one so much better than the first one. I still think Lily is a bit of a snob, but she was much more likeable in this one. Maybe because she clearly isn't as smart as she thought she was? I mean, come on, nothing seemed off? That's all I'll say about that. The structure worked better in this one since the interlude and the first story connected more to the last part. I still think it's an odd form, but I guess it's the easiest way to get Sebastian's perspective. I'm on to the next one in the series, hoping it continues to get better. **Edit** I forgot to mention the cat! At first, I was thinking, "A talking cat. Really?" But I actually like the talking cat. Go figure. I love this series and I’m only on book two. You can’t help but to fall in love with the characters and cheer them on. You get magic, secrets, action, flirtation, a not so conventional witch, a clever cat, and a proper English woman. You join Lily on a quest to stop a theft, with a little help from her friends. What she comes upon unravels her past and clouds her future. Page turner that left me to downloading book three to get more. Well, Revelations was certainly...revealing. Ha. Actually, book two did uncover many things I'd been dying to find out while also illuminating just how much we still don't know. I immediately started the third book after finishing this one. I'm glad I did as the story keeps delving deeper and becoming more interesting, however, I am now mixing the second book with the beginnings of the third, so for the purposes of this review I'll leave it at: Read this series! Sherrer is a good author with great ideas. I am looking forward to reading more of this series. Great characterization with good ideas. The plotting breaks down occasionally. My main objection is the female lead who has a bit of a cliche tendency to get into trouble by ignoring the obvious.